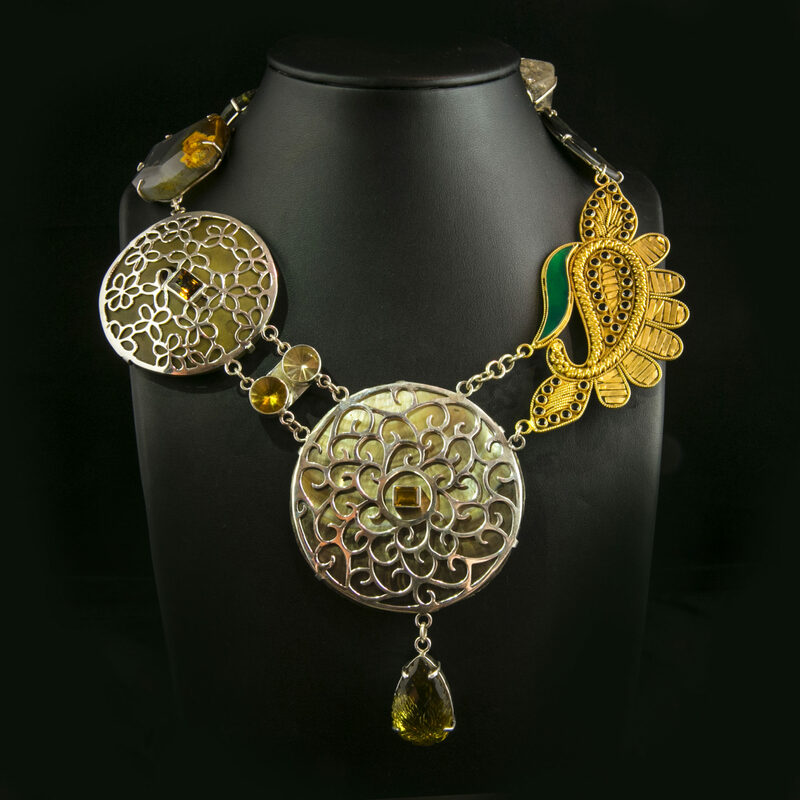 Stunning necklace of faceted tourmaline & citrine set into hand-cut silver discs, gold plated, green onyx & black spinel set paisley design, is linked to agate, green turquoise ring, quartz nugget and shell. 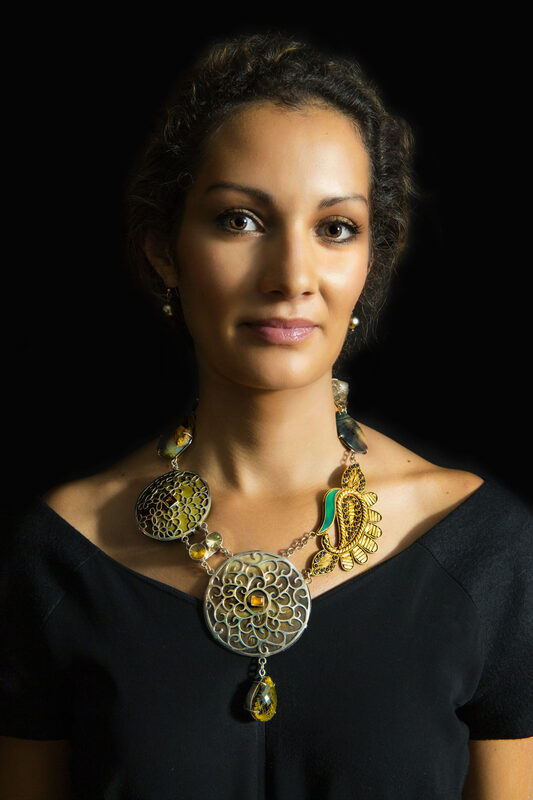 India was the inspiration for this necklace. Jane always felt close to India as she recalls the many stories her loved maternal, multi-lingual, highly talented grandfather told of his childhood spent in India as the son of a father, comfortably positioned in the English army. 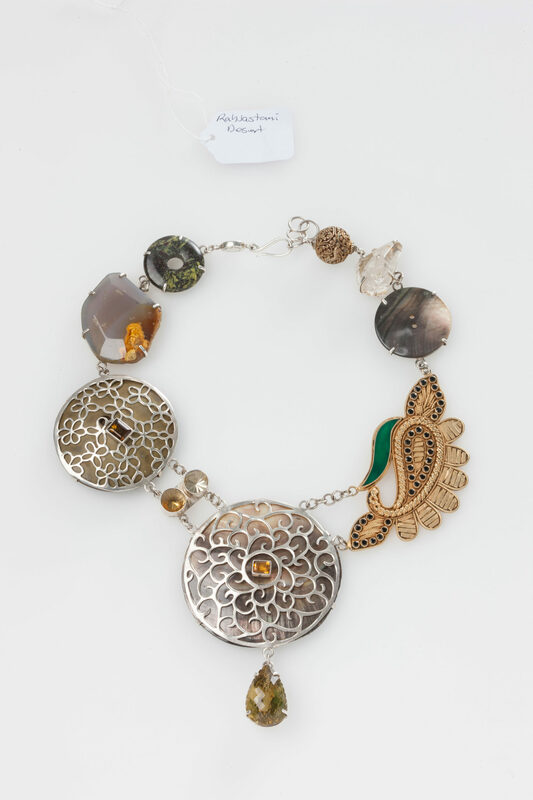 This necklace refers to Jane’s numerous trips to Rajasthan, Jaipur, in particular, as a place of many unexpected adventures. In this work Jane has utilised the indigenous Indian jaali work (where the silver or gold is cut out like decorative lace work) that gives richness and character to each such piece. The gold plated silver paisley is a direct reference to the textile industry of particular parts of India such as Rajasthan. India holds a very personal place in my mind and heart – as the early home of my loved maternal grandfather whose family spent his childhood in India. My grandfather was fluent in Hindi, English, French and Arabic. I always felt close to India as I recall my grandfather telling me stories of his childhood – while I was a child. My great-aunt was named after a hill-station in India: Nanatal. I resolved to visit India one day as it represented part of my family’s history. My grandfather migrated with his family to Australia in his late teens. I first visited India during an academic research trip around the world. I later visited Jaipur as a jewellery designer and manufacturer. This necklace refers to my numerous trips to Rajasthan and Jaipur in particular. For us, Rajasthan is a place of numerous adventures and always being confronted with the unexpected. The Pink City is surrounded by desert and bush that harbours numerous dangerous animals: tigers, leopards, various monkeys and snakes. Camels are a common sight working in the streets. The desert has shaped the city, the patience, endurance and good humour of the people who confront hardship on a daily basis. For me Jaipur is an exciting place: where I never know what treasure (or craftsman’s skill) I will find next. This then stimulates my mind to create something exciting with the gems that I find. In this work I have utilized the indigenous jaali work of the Indians, where the silver or gold is cut out like decorative lace work creating shadows on Mother-of-Pearl or coloured linings underneath) that gives richness and character to each such piece. The gold plated silver paisley is a direct reference to the textile industry of particular parts of India such as Rajasthan.